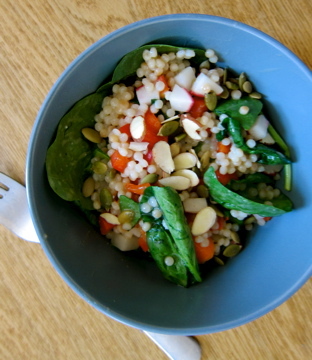 I am no stranger to Israeli couscous salads. They are the perfect throw-together meal. Salad as an entree. Grain + veg. + protein. Check. And after this year, I am no stranger to the wonders of white miso. I have been cooking up a miso storm this year. From satisfying miso soup with soba noodles to a cozy carrot soup with miso and sesame. From roasted veggie + tofu miso red curry smash to wild rice salads with all the fixings. And Chef Chloe has an excellent recipe in her cookbook for miso-glazed eggplant. All of these recipes are absolutely fantastic. Israeli Couscous + Miso may not sound like they go together, but the buttery smooth rounds of couscous combine perfectly with the creamy flavor of the miso. And all those crunchy veggies, seeds, and nuts provide the texture to keep my mouth entertained. This salad is totally vegan. It could be made gluten free if you switch out the couscous with brown or wild rice. You could still stay vegetarian and add a poached or hard-boiled egg (or cubed tofu) as an extra boost of protein to complement the salad. 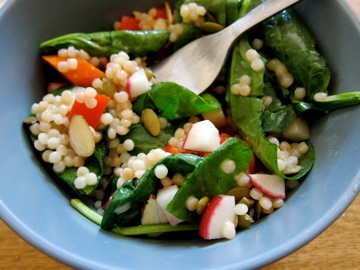 Psst…did you know that radishes produce a compound shown to help support the body’s natural detoxification system? The skin is a major detox organ in the body, so the more radishes and detoxifying foods we eat, the clearer and healthier our skin will look! Get into it. Make the couscous according to the directions on the box (toast the couscous in a pot, pour boiling water over it, simmer until done). 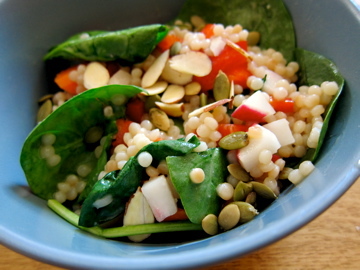 In a large bowl, combine the spinach with the chopped vegetables, pumpkin seeds, and almonds. Add the cooked couscous (I like to add the couscous when it is still warm). 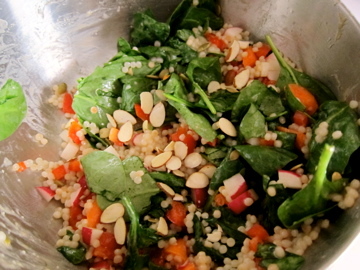 Toss the salad and add the dressing, a little at a time, to your liking. Whisk all ingredients together. Leftovers can be stored in a glass jar in the fridge for up to a week. Would love to know if there is a print option for your recepies?